Table cards are personal greeting for every of visitors, as it is attention and thanks statement about that he or she has come. But table card can be as a gift, which you could bring home. Before couple of years, I was in Germany, in wedding, where couple was looked after, that every visitor had to their table cards bottle closers with bride/husband silhouette. That was very nice attention statement for visitor! Very often table cards are made in one style with invitations, they’re as table decoration too. With them could easy add decoration on table and they can help to create the right event mood, especially if it’s wedding or topical event. 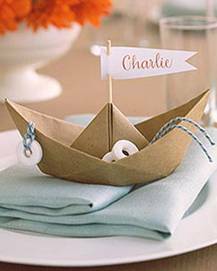 Below are some ideas for table cards with sea topics, where are used natural materials – seashells, sand, starfish, rocks etc. Table cards can be different – classical, low-keyed, paper, square formed, bought in book shop or made after individual order; but can be originative (as you know, here are about them), self-made, not traditional, original and “eatable”. The last serves, as place orders, as extra snack. Mostly on table cards are shown just visitors name, but can write a poem or quote about concrete event thematic; gratitude for that visitor came; event date, thematic, event organizer; personal quote for visitor etc. If event visitors need to sit in separated tables, then table number too. Classically table card is set left from the dish edge or on the napkin, but as it could be put on chair or even on dish, if concrete table card style asks for it and if it includes in table design. I found a variety, when table card is put on glass. It’s original, isn’t it? Preparing table cards, you can dream about everything, of course, if it isn’t formal event. Event visitors name and table number can write on rock or lemon, order a etching in mug or design on napkin, ribbon; table card could be as origami; put in flower composition etc. I hope, that here summed up ideas will help to get your event much original and will bring for yourself and for guests some happiness and positive surprise.